Wednesday April 2nd 1879 It was cold and wintry. Mother and Hatt went out to Mrs Bames visiting. I got the dinner alone. I finished the lamberquins in the afternoon and wrote a long letter to Dottie in the eve. Thursday April 3rd 1879 I worked in the carpet rags till nearly the middle of the afternoon and then I went to town in the phaeton with Lee. Hatt was down to Lathrup a little while too. I did some shopping for myself. I worked all the evening on a tidy I began. Weather cold and windy. Rob is twenty five years old today. 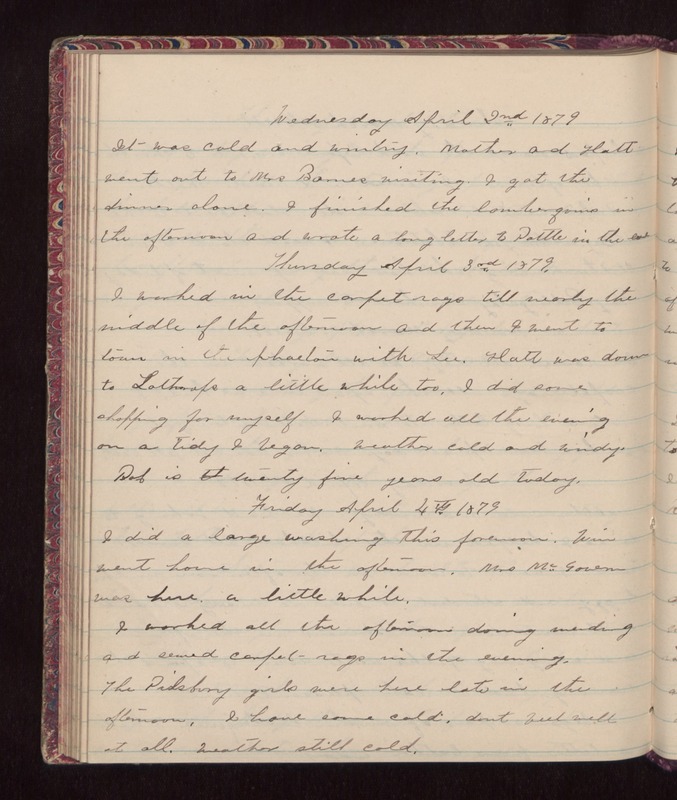 Friday April 4th 1879 I did a large washing this forenoon. Win went home in the afternoon. Mrs. McGovern was here a little while. I worked all the afternoon doing mending and sewed carpet rags in the evening. The Pilsbury girls were here late in the afternoon. I have some cold, dont feel well at all. Weather still cold.